With a few days of wetness weighing heavy upon me, I was begining to despair. Its not so bad when you're riding-- but when you stop or camp for the night, then-- well, it is not so pleasant. The other day, when looking for a place to camp, I took a few side roads and happened upon a gardener harvesting his vegetables. I asked him if it would be alright to set up a tent in the field down the road. He insisted I use a beautiful patch of grass beside his field with a sweeping view of the farms all around. In the morning, he invited me in for coffee. The sun came out, I put my gear out to dry, and we talked and talked over breakfast. 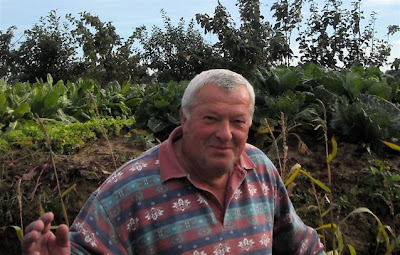 An avid gardner and farmer who has lived in the area for all his life, he was fascinating to talk to. We talked of the old ways of harvesting and all the wonderful things you can do with the things that grow in France. I learned much about French cuisine and generosity! My gear was drying so nicely in the sun, that he invited me to stay for lunch. After fish, salad, cheese, wine and coffee I departed full, coffe-ed, and Praise to the Universe--dry! Drying out proved a fantastic excuse for the two of us to get to know each other and share a bit of culture. Again, its so uncanny how the bad things turn out to be blessings in disguise. I took his portrait and will be adding it to the 1Mandala with gladness. I write from the steps of a Church as I head off down the highway. I head towards Brussels. The sun is out and the wind is at my back. Trench or Tent? The lows. My friend Vaughn has chided about blogging only about the highs of my journey. He said surely I must not be writing about the lows! Well, Vaughn, there has been some lows of late. The last few days haven't been so good-- wet to be precise. The other night, not thinking that it would really rain hard I neglected to properly secure my tent's tarp. It rained hard. I woke up with cloths bag soaked. I am in Normandy, and it is not known for its sunny autumn weather. That day and the next were either cloudy or damp. When finally the sun broke out, I happily set out my tent and cloths to dry while I checked my e-mail at a cafe. A sun storm broke out! All my stuff was soaked again. Then the night after that, after working late from a McDonalds, I was forced to put up my tent in the dark, and in the rain. THAT sucked. It was the first time in my three months of my voyage that I had to do that. It was a damp night in a mystery field. Then last night, camping in the region of La Somme France, I had a firsthand glimpse of what it must have been like for first world war soldiers. 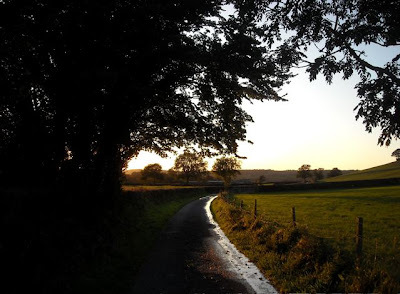 Don't get me wrong, this area of France is really beautiful, but, it is muddy. Everywhere. The field where I set up my tent no exception. There was also the first frost last night! It was cold and damp. 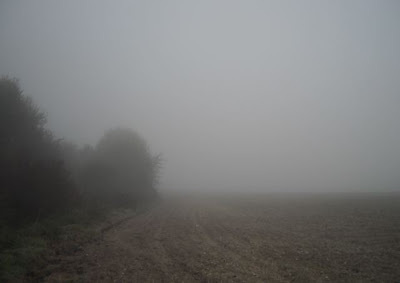 I woke up to a gray mist shrouding my gray muddy field. Was I in a trench, or in a tent? I had to pinch myself. I can't even begin to imagine life in WW1 trench, day in day out. 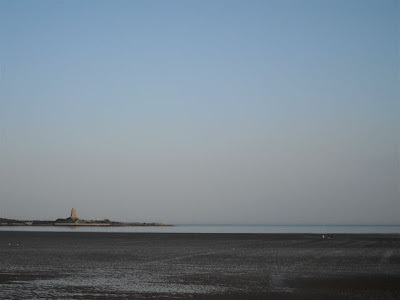 One of my first sights in France was a centuries old, stone lighthouse. 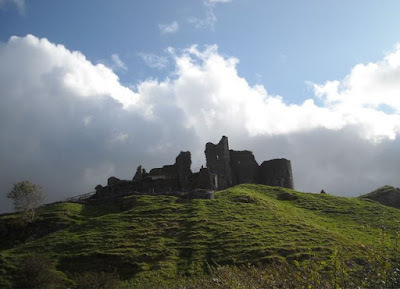 It stood tall on a looming rocky crag and could be seen for miles and miles. Built in the sixteenth century it is France's second oldest light house. 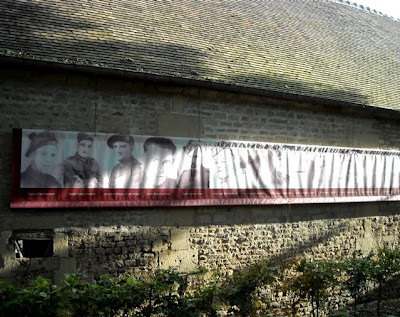 I have been writing much about my experiences of the vestiges of war as I travel through Normandy. Its a particularly challenging experience as I work on the Oneness Mandala project. In contrast to the irrationality and destruction that were the legacy of the occupation-- the idea of Oneness-- deeply comprehending our interconnectedness, makes me think of this stone lighthouse. Oneness, has been taught for centuries in various guises in virtually all religions. Just today the priest in an old Cathedral was teaching on "Love another as you love yourself"-- one such representation of our essential interconnectedness. Oneness is a solid, and powerful concept that stands as a tall, bright beacon of hope on our collective horizon. Remembering the stories of death, destruction and sacrifice are important to keeping War from happening again. Remembering that we are all one, beyond the illusurary lines of race and nation, is even more important. 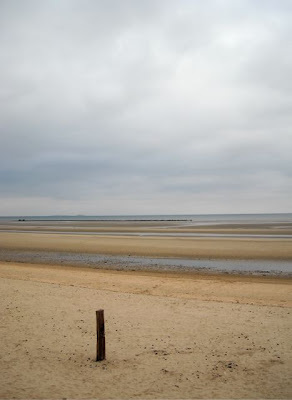 My journey is taking me through the beaches and fields that were the site of the Normandy Invasion and D-Day back in June of 1944. I am not into military history, only by osmosis through my brother and father's great interest in it. Nonetheless, it is proving to be a remarkable experience. Most recently, I visited the first bridge that was liberated in the early morning of June 6th by a daring attack by British gliders. I thought of my Grandfather. During the war he had been one of the lead engineers behind the construction of American gliders. The British gliders were so successful that I couldn't help but think they had borrow some ideas from my Grandfather! He was known in his firm as 'The Uninhibited Mind'. The story of the British seizing of the bridge is pretty amazing. The bridge was liberated by a daring team of British gliders and paratroopers. They used their gliders to swooped in soundlessly on the Germans. They crash landed in the nearby swamp, got out, attacked and caught the Germans by surprise. They were able to capture the key canal bridge only two minutes off schedule. Amazingly the Germans didn't even have a chance to blow the bridge-- which had been set with explosives. The Bitish troopers radioed in their success, and the rest of the Allied invasion began to roll in onto the beaches of Normandy. I have now passed through and visited places like Utah and Omaha beach, the American war cemetary, the villages where the American and British paratroopers landed. I have spoken to farmers and Frenchman who remember the war and its aftermath and have told me all sorts of stories-- stories of destruction, but also of hope. I have even camped on top of old German pillboxes-- remnants of the German's formidable Great Atlantic wall! It is a challenging juxtaposition as I work on my World Oneness Mandala and pass through the vestiges of war. More on this in my next entry. On the night of June 7th, outside a small abbey in Caen, France, twenty Canadian soliders were executed. The Allied forces had begun invading Normandy on the 6th, and the German had been holding the Candians prisoner in the make shift garrison at the abbey. That night, just days before the German's would have retreated or surrendered, the soliders were lined up outside the old abbey, and shot. It was a quiet garden the morning that I visited. The sun was glittering through the trees, and the leafs gently falling amidst the wreaths that even today are being layed at the small monument. 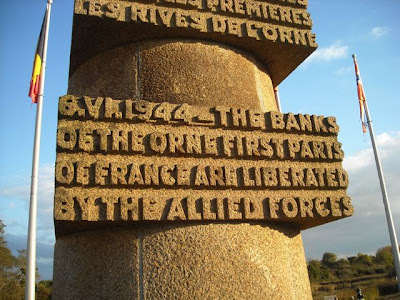 Its an inconspicuous place, removed from the city, but the story must be well known, because my host who was born in Caen as the war ended, made it the first place we visited. I've visited numerous memorials and monuments on my journey through Normandy now. This one however, more than even the grand museums for the invasion, hit my heart. On the wall of the abbey, were the photos of the soliders. All were in there 20's and early 30's. They were so close to having made it to the end of the war. Caen is a medium sized city in Northern France. I arrived there yesterday evening after an impromptu invitation from a cyclist who I had met on the road several days earlier. He and his partner proceeded to host me for the evening with fabulous generosity that I simply can't get over. Perhaps it was because I had simply expected to camp on their lawn that night, perhaps it is because such simple things as a shower and doing laundry are such fabulous luxuries for me. Regardless, but it was an incredible visit with two kind and interesting people. The shower and the laundry out of the way, they treated me to two great meals replete with French cuisine, wine, cheese, aperitifs. I again, was simply expecting to heat up my left over rice! However, the real treat were our fascinating conversations on French culture and history late into the evening and the next day into afternoon. Before I left, Alain, a retired professional corrector for Le Monde, showed me around Caen. This include attending an afternoon choir, visiting two cathedrals, and the cemetary of 27 Canadians exucuted just before the end of the war. That was particularily moving. More on that in my next entry. Here in Normandy, France, I find myself riding through some of the most renown battle fields of World War II. On June 6th, 1944, the Allies launched their invasion of occupied France on the beach and fields I have today been riding through. On that day, D-Day, the sea outside me would have been filled with ships, the sky with paratroopers, and the land with shells, shouts, and screams. The other night I set up my tent in the field of French farmer. He and I spoke late into the night about the stories seeped into the land around us. His small village had seen some of the fiercest fighting. Allied paratroopers slid down roofs, hung off the Church steeples and fought gun battles with the Germans in the Church itself. I didn't realize but the the sea invasion by the allies took over a week of intense fighting. 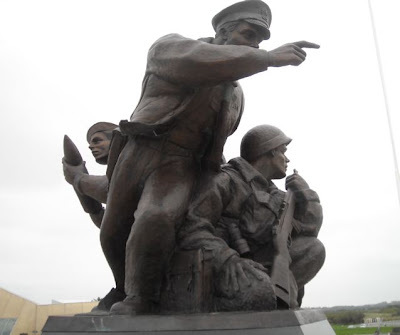 In the farmer's town, paratroopers had to retake the town three times from a crack regiment of German paratroopers. When his father and grandfather returned to the town, all the livestock were dead, and the buildings shot up. The entire top of the Church had to be replaced. Not only this but the occupation had split the community-- there were those who resisted the German occupiers and those who collaborated. The landscape of this land is now irrevocably seaped in the memory of those days and the thousands who died there. Monuments and museums are everywhere. What a conversation. All my years of learning French in Canada, were made worthwhile by being able to hear and speak to this farmer. France. Here I am. My journey progresses like a dream. I sit in a small cafe by the sea in a small town by the name of St. Isny sur Mare. A fantastic series of adventures, fueled by the uncanny generosity of the French people I have met, has unfolded since my arrival. I literally have not been able to spend one Euro of my own money for the last three days. Yet, outside, my bike is laden with more food than I can squeeze into my pouches, all my computers are charged, I am showered, have everything I could possibly need, and have eaten like a King the last two nights. I mentioned in my last post that I was starting to loose faith in money as a means to make things happen. I am now thoroughly convinced in the futility of worrying about money. 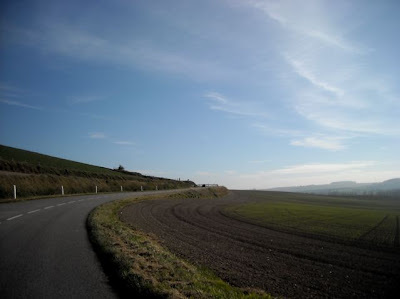 Arriving in Cherbourg, I road into a glorious sun rise as I pedaled my first French kilometres. Along the road I ran into a lady picking Chestnuts, she advised me how to pick and cook them. Another lady showed me how to harvest coquilles and muscles on the beach. My first evening, after a fabulous conversation with the farmer who lent me his field for the night, I dined on roasted chestnuts and muscles cooked in donated white wine and butter. Not a seafood fan, I was warry at first of the strange looking crustucians, however, by the last shell I was thoroughly converted. Wow. I had one fabulous meal. Then, this past night, seeking only to fill up my water bottles at a farm house on the side of the road, an incredibly kind young French and Dutch couple let me camp outside their 17th century manor. Not only this, but they invited me inside to a rolling multiple course meal as we discussed France and Canada and the world. This morning I was gifted by fresh croissants and yet another coffee. I say 'yet another coffee', because that day I was gifted by not one but four coffees! After breaking camp at the Famers I was lamenting not having had my morning coffee-- my supply had ran out. I met a group of French cyclist who treated me to a coffee, and then a fabulously interesting English lady who also treated me to two coffees. By the end of the day I gone from lack to overdose! This entry rambles. Yet, it feels unjust to not at least touch upon each of these encounters that could indeed each make an entry. I suspect I will soon touch on all the ideas that my many conversations and experiences have inspired as I progress. I write under the moon and starry sky in an ancient oak forest. I sit outside my tent after a nice hot meal prepared on my cook stove. As the moon rises the mist creeps across the meadow towards me. Off in the distance I can hear the stags battling it out with their antlers. It is the third time I find myself camping under this same oak tree. As I play my flute to the wild horses and deer, I feel like a character in some fairy tale or legend. It is my last night in England. Tomorrow night I will sail for France. My friend Eric jostled my attention with his use of the word 'epic' to the describe things. Its a good word. My time here has been Epic. I departed to England with much trepidation-- indeed fear. I left with great reluctance nurturing Northamerica where all my friends and family are to expensive England where I knew not one person. I planned only to be in the country for 10 days before escaping to France. I have now been here over a month! And, not only am I still alive, I am overwhelmed with what a rich time I have had. The first time I found myself under this oak tree was out of desperation. A horrendous series of flat tires, mishaps, massive computer malfunctions and running out of money, forced me off the road into the forest to fix my bike and camp. I didn't even have water! It was exceptionally trying day that I dare say wounded me in spirit. Yet here I am again under the same oak tree. All is not only resolved, but greatly improved. I have had a warm meal, my cloths are clean, my bike is in full form, my laptop purring nicely. I have water! I choose to camp here tonight to meditate on both that bad day and this great month. 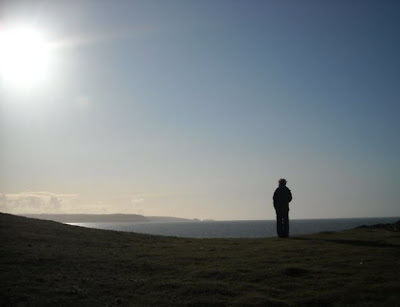 I leave England having found love, crop circles, castles, cricket, white horses, medieval silver coins, stone circles, and countless adventures. I have run into an old friend, made new ones, learned some Welsh, partaken in feasts, and sampled many an ale. My ears have been graced by choirs and my eyes dassled by beautiful and ancient sites. Incredibly, I think I have even gained weight over here! Having returned here to this oak tree a final time to heal and reconcile myself with some of the hardships that I have met and overcome, is extraordinarily symbolic. Again, its almost as if I am a character in some legend or myth. Joseph Cambell would smile. France now beckons. I no longer cross over the ocean with fear. I no longer even cross with any expectations. What futility! Not even Nostradamous could have predicted what I have found here. Well, well, I just logged in to make an entry, when I noticed the number beside the post on my Blogger Dashboard. This is my 100th post! I still remember a late night in Smithers, after a long postponement, determined to get a blog going, setting it up, and chosing the name 'Missive 452' in a rush of impetuous passion. I then made my first post ("Hello World!"). That was all within a 5 minute space of time! The blog has progressed greatly since that two word entry. Yesterday, I had yet another comment on my adventures and my writing that I should write a book! I don't quite no about that yet. First I need to get to Berlin. That feels daunting enough. I will keep the posts coming though. My life is so rich at the moment, it feels like a travesty to not express the feelings and thoughts that my journey is inspiring. Its becoming a real pleasure. Crafting the words, adding photos, and then posting to the world is a real exercise in authenticity. I am declaring and defining myself on a daily basis. There's no hiding here! Ok... on to the next post! At this time in England, the black berries are hitting their perfect ripeness. On the side of roads and paths, their heavily landen branches bend and beckon to the passerby. I've been indulging greatly in these tasty treats. As I eat them on the roadside, cars fly by impervious to the bounty. To be sure, they will arrive in the next town much sooner. Yet, if they keep to such speeds, they will surely be missing out on a great pleasure. I couldn't help but think that they are a great metaphor for life. Before I left Canada, there stories in the media about how the fantstic health benefits of fresh berries. First, picked, they are as fresh a food as you can get. Second, they are intense packets vitamins and anti-carcinogens. Third, unlike pills and pharmaceuticals they digest and enter your system smoothly. And as an added bonus they are free and there's no packaging involved! However, there is one major requirement for benefiting from fresh berries: You need to be going at a pace where you can both see that they are there on the side of your road, but that you can stop, and pick them one by one. If one is cruising through life at high velocity, then sorry, no berries! One misses the bounty and the beauty that the universe is clamoring to offer to you from only feet away on the side of the road. I've been enjoying a lot of berries lately. Literally and figuratively. Here is another painting from my time on the coast of England. There's something about how the stillness of the sea, the brightness of the blue sky and the warmth of the sun can mirror what one feels within. One of the most notable ideas about England that I had in my mind before arriving were its white coastal cliffs. In my time in Swanage I had an opportunity to experience them first hand. In the spirit of Dali's psychological landforms, the cliffs have made their way into my painting. Here is the first of a series of paintings which are inspired by my time in England. The shot above shares a little of the ambiance of its creation-- working on a rainy day in an old country house in wales as the strangely bright gray light of the late afternoon spills in. 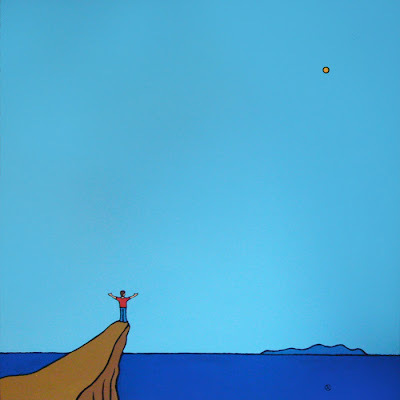 There are two inspirations behind the painting. First, my visit to a Dali exhibit at the MoMA. Dali had a way of painting his surrealist scenes with strange, curvaceous and highly suggestive hills and mountains. So much so that they seemed more psychological than representational. His work was of course described as deeply subconcscious and Freudian. 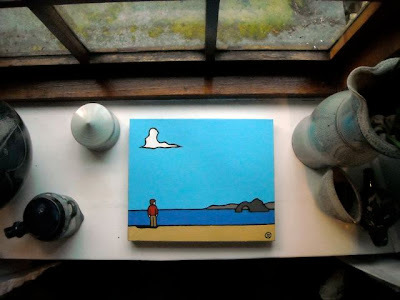 The second inspiration is my recent stay on the Southern coast of England. The cliffs and coast actually look like this. As I stood, and stared out to sea, I couldn't help but ponder if the wonderful moment, the convulsed cliffs, and the smooth sea was purely a fabrication of my mind. Perhaps Dali wondered the same things. I am tremendously enjoying this simplified style of painting. It is alot more challenging than it looks to get these paintings right. Because there are such few elements, each element must carefully be positioned and proportioned in relation to the rest. The raw simplicity of the composition gives additional power to the colours. The colours then set the mood and the sparse set of symbols open up the scene for rich emotive interpretations. This morning I sat down for breakfast in Wales. I am here visiting Louisa and her family in the Welsh countryside in Llanllwni, Carmarthenshire, Wales. 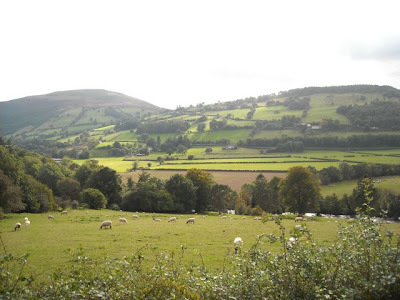 All about are the greenest of fields, dark rolling hills (they call them the Black Mountains), hedges and lots and lots of sheep. I keep exclaiming how wonderfully English my moments are. However, that is no longer precisely true-- Wales is decidedly its own place-- all the road signs are perplexingly lettered--they are in Welsh! My experiences continue not only geographicaly and culturally, but now in the realm of self discovery. Despite being in Wales, Louisa family is very much English. In this most unlikely of places, I discovering much about my childhood upbringing and my subliminal English heritage. You see, my father spent a few years in England before he was married. My father and mother also spent some time in England right after they were married. I am discovering just how influential this time was on them-- and me. Aspects of my upbringing that I took for granted as 'normal' are now being revealed to me as exceptional and decidedly English. This morning as I had breakfast at the Harrington dinning table I noticed the placemats featuring scenes of the English countryside. They were just like back at my parent's dinning table. It struck me that in all my time living in North America, I have never seen any such placemats in any other home. This was my first time seeing them elsewhere. I was assured that here in England they are available at department stores and quite common. In Canada, they are not common! The plates and bowls also had ornate english scenes in a green monotone-- just like at our dinning table. The preserves, the marmite, the Weetabix! Noboby eats Wheatabix or marmite in Canada! Yet all these were definitive elements of my upbringing's tabletop. Then there are the castles and knights I played with, boiled eggs, marmelade, afternoon tea, and my Dad's penchant for classical music. What does this all mean? Well, it is sure interesting. Each little discovery brings back a flood of memories and a flash of understanding. I supposed it feels a little like learning the name of new tree or bush in a forest. It doesn't change anything in the forest, but it does deepen one's understanding of how everything is interconnected. I am discovering that little bits of English culture like this are trees that make up the Forest of Russell.